Prof. (Dr.) Waressara Weerawat, Director of Logistics Innovation Center, Department of Industrial Engineering, Faculty of Engineering, Mahidol University, Thailand. Prof. (Dr.) Yen-Chun Lin, Professor and Chair, Dept. of Computer Science and Information Engineering, Chang Jung Christian University, Kway Jen, Tainan, Taiwan. Divya Sethi, GM Conferencing & VSAT Solutions, Enterprise Services, Bharti Airtel, Gurgaon, India. Prof. (Dr.) Atul K. Raturi, Head School of Engineering and Physics, Faculty of Science, Technology and Environment, The University of the South Pacific, Laucala campus, Suva, Fiji Islands. Prof. (Dr.) Hadi Suwastio, College of Applied Science, Department of Information Technology, The Sultanate of Oman and Director of IETI-Research Institute-Bandung, Indonesia. Dr. Nitin Jindal, Vice President, Max Coreth, North America Gas & Power Trading, New York, United States. Prof. (Dr.) Thanakorn Naenna, Department of Industrial Engineering, Faculty of Engineering, Mahidol University, Thailand. Prof. (Dr.) Jose Francisco Vicent Frances, Department of Science of the Computation and Artificial Intelligence, Universidad de Alicante, Alicante, Spain. Prof. (Dr.) Huiyun Liu, Department of Electronic & Electrical Engineering, University College London, Torrington Place, London. Prof. (Dr.) Kimberly A. Freeman, Professor & Director of Undergraduate Programs, Stetson School of Business and Economics, Mercer University, Macon, Georgia, United States. Prof. (Dr.) Klaus G. Troitzsch, Professor, Institute for IS Research, University of Koblenz-Landau, Germany. Prof. (Dr.) T. Anthony Choi, Professor, Department of Electrical & Computer Engineering, Mercer University, Macon, Georgia, United States. Prof. (Dr.) Fabrizio Gerli, Department of Mangement, Ca' Foscari University of Venice, Italy. Prof. (Dr.) Jen-Wei Hsieh, Department of Computer Science and Information Engineering, National Taiwan University of Science and Technology, Taiwan. Prof. (Dr.) Jose C. Martinez, Dept. Physical Chemistry, Faculty of Sciences, University of Granada, Spain. Prof. (Dr.) Panayiotis Vafeas, Department of Engineering Sciences, University of Patras, Greece. Prof. (Dr.) Soib Taib, School of Electrical & Electronics Engineering, University Science Malaysia, Malaysia. Prof. (Dr.) Vit Vozenilek, Department of Geoinformatics, Palacky University, Olomouc, Czech Republic. Prof. (Dr.) Sim Kwan Hua, School of Engineering, Computing and Science, Swinburne University of Technology, Sarawak, Malaysia. Prof. (Dr.) Rafael Ignacio Alvarez Sanchez, Department of Science of the Computation and Artificial Intelligence, Universidad de Alicante, Alicante, Spain. Prof. (Dr.) Francisco Miguel Martinez, Department of Science of the Computation and Artificial Intelligence, Universidad de Alicante, Alicante, Spain. Prof. (Dr.) Antonio Zamora Gomez, Department of Science of the Computation and Artificial Intelligence, Universidad de Alicante, Alicante, Spain. Prof. (Dr.) Leandro Tortosa, Department of Science of the Computation and Artificial Intelligence, Universidad de Alicante, Alicante, Spain. Prof. (Dr.) Samir Ananou, Department of Microbiology, Universidad de Granada, Granada, Spain. Dr. Miguel Angel Bautista, Department de Matematica Aplicada y Analisis, Facultad de Matematicas, Universidad de Barcelona, Spain. Prof. (Dr.) Prof. Adam Baharum, School of Mathematical Sciences, University of Universiti Sains, Malaysia, Malaysia. Prof. (Dr.) P. Bhanu Prasad, Vision Specialist, Matrix vision GmbH, Germany, Consultant, TIFAC-CORE for Machine Vision, Advisor, Kelenn Technology, France Advisor, Shubham Automation & Services, Ahmedabad, and Professor of C.S.E, Rajalakshmi Engineering College, India. Prof. (Dr.) Anis Zarrad, Department of Computer Science and Information System, Prince Sultan University, Riyadh, Saudi Arabia. Dr. Cristiano De Magalhaes Barros, Governo do Estado de Minas Gerais, Brazil. Prof. (Dr.) K. SenthilKannan, Dean & Director Research, Vice Principal and Research Scientist, Edayathangudy G S Pillay Arts & Science College Nagapattinam. Prof. (Dr.) Mohamed Saber Mohamed Gad Nemat Alla, Mechanical Engineering Department, Engineering, Research Division, National Research Centre (NRC), El Dokki, Giza, Egypt. P.O.B. 12622. Assistant Research Professor (Dr.) Anil B. Shrirao, Ph.D., Department of Biomedical Engineering,Rutgers, The State University of New Jersey, Piscataway, NJ, USA. Prof. (Dr.) Hamid Ali Abed Alasadi, Head of Computer Science Department, Faculty of Education for Pure Science, Basra University, Basra, Iraq. Prof. (Dr.) Vishnu Narayan Mishra, Assistant Professor of Mathematics, Sardar Vallabhbhai National Institute of Technology, Ichchhanath Mahadev Road, Surat, Surat-395007, Gujarat, India. Prof. (Dr.) Pawan Kumar Bharti Chauhan, Scientist, Antarctica Laboratory, R & D Division, Shriram Institute for Industrial Research, Delhi, India. Prof. Shashikant Shantilal Patil SVKM , MPSTME Shirpur Campus, NMIMS University Vile Parle Mumbai, India. Prof. (Dr.) Joel Saltz, Emory University, Atlanta, Georgia, United States. Prof. (Dr.) Dilum Bandara, Dept. Computer Science & Engineering, University of Moratuwa, Sri Lanka. Prof. (Dr.) G. Manoj Someswar, Principal, Dept. of CSE at Anwar-ul-uloom College of Engineering & Technology, Yennepally, Vikarabad, RR District., A.P., India. Prof. (Dr.) Abdelghni Lakehal, Applied Mathematics, Rue 10 no 6 cite des fonctionnaires dokkarat 30010 Fes Marocco. Dr. Kamal Kulshreshtha, Associate Professor & Head, Deptt. of Computer Sc. & Applications, Modi Institute of Management & Technology, Kota-324 009, Rajasthan, India. Prof. (Dr.) Anukrati Sharma, Associate Professor, Faculty of Commerce and Management, University of Kota, Kota, Rajasthan, India. Prof. (Dr.) S. Natarajan, Department of Electronics and Communication Engineering, SSM College of Engineering, NH 47, Salem Main Road, Komarapalayam, Namakkal District, Tamilnadu 638183, India. Prof. (Dr.) Asmita Das , Delhi Technological University (Formerly Delhi College of Engineering), Shahbad, Daulatpur, Delhi 110042, India. Prof. (Dr.) K.Srinivasmoorthy, Associate Professor, Department of Earth Sciences, School of Physical,Chemical and Applied Sciences, Pondicherry university, R.Venkataraman Nagar, Kalapet, Puducherry 605014, India. Prof. (Dr.) Bhawna Dubey, Institute of Environmental Science( AIES), Amity University, Noida, India. Prof. (Dr.)P.Raviraj, Professor & Head, Dept. of CSE, Kalaignar Karunanidhi, Institute of Technology, Coimbatore 641402,Tamilnadu,India. Prof. (Dr.) Damodar Reddy Edla, Department of Computer Science & Engineering, Indian School of Mines, Dhanbad, Jharkhand 826004, India. Prof. (Dr.) T.C. Manjunath, Principal in HKBK College of Engg., Bangalore, Karnataka, India. Prof. (Dr.) Pankaj Bhambri, I.T. Deptt., Guru Nanak Dev Engineering College, Ludhiana 141006, Punjab, India . Prof. (Dr.) Shambhu Nath Choudhary, Department of Physics, T.M. Bhagalpur University, Bhagalpur 81200, Bihar, India. Prof. (Dr.) Venkateshwarlu Sonnati, Professor & Head of EEED, Department of EEE, Sreenidhi Institute of Science & Technology, Ghatkesar, Hyderabad, Andhra Pradesh, India. Prof. (Dr.) Saurabh Dalela, Department of Pure & Applied Physics, University of Kota, KOTA 324010, Rajasthan, India. Prof. (Dr.) R.S.Chanda, Dept. of Jute & Fibre Tech., University of Calcutta, Kolkata 700019, West Bengal, India. Prof. V.S.VAKULA, Department of Electrical and Electronics Engineering, JNTUK, University College of Eng.,Vizianagaram5 35003, Andhra Pradesh, India. Prof. (Dr.) Nehal Gitesh Chitaliya, Sardar Vallabhbhai Patel Institute of Technology, Vasad 388 306, Gujarat, India. Prof. (Dr.) D.R. Prajapati, Department of Mechanical Engineering, PEC University of Technology,Chandigarh 160012, India. Dr. A. SENTHIL KUMAR, Postdoctoral Researcher, Centre for Energy and Electrical Power, Electrical Engineering Department, Faculty of Engineering and the Built Environment, Tshwane University of Technology, Pretoria 0001, South Africa. Prof. (Dr.)Vijay Harishchandra Mankar, Department of Electronics & Telecommunication Engineering, Govt. Polytechnic, Mangalwari Bazar, Besa Road, Nagpur- 440027, India. Prof. Varun.G.Menon, Department Of C.S.E, S.C.M.S School of Engineering, Karukutty,Ernakulam, Kerala 683544, India. Prof. (Dr.) U C Srivastava, Department of Physics, Amity Institute of Applied Sciences, Amity University, Noida, U.P-203301.India. Prof. (Dr.) Surendra Yadav, Professor and Head (Computer Science & Engineering Department), Maharashi Arvind College of Engineering and Research Centre (MACERC), Jaipur, Rajasthan, India. Prof. Naveen Jain, Dept. of Electrical Engineering, College of Technology and Engineering, Udaipur-313 001, India. Prof. Veera Jyothi.B, CBIT ,Hyderabad, Andhra Pradesh, India. Prof. Anuj K. Gupta, Head, Dept. of Computer Science & Engineering, RIMT Group of Institutions, Sirhind Mandi Gobindgarh, Punajb, India. Prof. (Dr.) J.Babu, Professor & Dean of research, St.Joseph's College of Engineering & Technology, Choondacherry, Palai,Kerala. Prof. (Dr.) Pradip Kumar Roy, Department of Applied Mechanics, Birla Institute of Technology (BIT) Mesra, Ranchi â€“ 835215, Jharkhand, India. Prof. (Dr.) P. Sanjeevi kumar, School of Electrical Engineering (SELECT), Vandalur Kelambakkam Road, VIT University, Chennai, India. Prof. (Dr.) Debasis Patnaik, BITS-Pilani, Goa Campus, India. Prof. (Dr.) SANDEEP BANSAL, Associate Professor, Department of Commerce, I.G.N. College, Haryana, India. Prof. (Dr.) Megha Mittal, Faculty of Chemistry, Manav Rachna College of Engineering, Faridabad (HR), 121001, India. Prof. (Dr.) Juhana Jaafar, Gas Engineering Department, Faculty of Petroleum and Renewable Energy Engineering (FPREE), Universiti Teknologi Malaysia,81310 UTM Johor Bahru, Johor. Prof. (Dr.) Rita Khare, Assistant Professor in chemistry, Govt. Womenâ€™s College, Gardanibagh, Patna, Bihar. Prof. (Dr.) Muhammad Kamruzzaman, Deaprtment of Infectious Diseases, The University of Sydney, Westmead Hospital, Westmead, NSW-2145. Prof. (Dr.) R. HEMA KRISHNA, Environmental chemistry, University of Toronto, Canada. Prof. (Dr.) B.Swaminathan, Dept. of Agrl.Economics, Tamil Nadu Agricultural University, India. Prof. (Dr.) Sribas Goswami, Department of Sociology, Serampore College, Serampore 712201, West Bengal, India. Prof. (Dr.) Sunanda Sharma, Department of Veterinary Obstetrics Y Gynecology, College of Veterinary & Animal Science,Rajasthan University of Veterinary & Animal Sciences,Bikaner-334001, India. Prof. (Dr.) S.K. Tiwari, Department of Zoology, D.D.U. Gorakhpur University, Gorakhpur-273009 U.P., India. Prof. (Dr.) Raviraj Kusanur, Dept of Chemistry, R V College of Engineering, Bangalore-59, India. Prof. (Dr.) Pratima Tripathi, Department of Biosciences, SSSIHL, Anantapur Campus Anantapur- 515001 (A.P.) India. Prof. (Dr.) Sudip Das, Department of Biotechnology, Haldia Institute of Technology, I.C.A.R.E. Complex, H.I.T. Campus, P.O. Hit, Haldia; Dist: Puba Medinipur, West Bengal, India. Prof. (Dr.) Bimla Dhanda, Professor & Head, Department of Human Development and Family Studies College of Home Science, CCS, Haryana Agricultural University, Hisar- 125001 (Haryana) India. Prof. (Dr.) Dr. Anil K Dwivedi, Faculty of Pollution & Environmental Assay Research Laboratory (PEARL), Department of Botany,DDU Gorakhpur University,Gorakhpur-273009,India. Prof. R. Ravikumar, Department of Agricultural and Rural Management, TamilNadu Agricultural University,Coimbatore-641003,TamilNadu,India. Prof. (Dr.) P. Sanjeevi Kumar, Electrical & Electronics Engineering, National Institute of Technology (NIT-Puducherry), An Institute of National Importance under MHRD (Govt. of India), Karaikal- 609 605, India. Prof. (Dr.) Mansoor Maitah, Department of International Relations, Faculty of Economics and Management, Czech University of Life Sciences Prague, 165 21 Praha 6 Suchdol, Czech Republic. Prof. (Dr.) Zahid Mahmood, Department of Management Sciences (Graduate Studies), Bahria University, Naval Complex, Sector, E-9, Islamabad, Pakistan. Prof. (Dr.) N. Sandeep, Faculty Division of Fluid Dynamics, VIT University, Vellore-632 014. Mr. Jiban Shrestha, Scientist (Plant Breeding and Genetics), Nepal Agricultural Research Council, National Maize Research Program, Rampur, Chitwan, Nepal. Prof. (Dr.) Rakhi Garg, Banaras Hindu University, Varanasi, Uttar Pradesh, India. Prof. (Dr.) Ramakant Pandey. Dept. of Biochemistry. Patna University Patna(Bihar)-India. Prof. (Dr.) Nalah Augustine Bala, Behavioural Health Unit, Psychology Department, Nasarawa State University, Keffi, P.M.B. 1022 Keffi, Nasarawa State, Nigeria. Prof. (Dr.) Mehdi Babaei, Department of Engineering, Faculty of Civil Engineering, University of Zanjan, Iran. Prof. (Dr.) Gudikandhula Narasimha Rao, Dept. of Computer Sc. & Engg., KKR & KSR Inst Of Tech & Sciences, Guntur, Andhra Pradesh, India. Prof. (Dr.) Dhanesh singh, Department of Chemistry, K.G. Arts & Science College, Raigarh (C.G.) India. Prof. (Dr.) RAMEL D. TOMAQUIN, Dean, College of Arts and Sciences Surigao Del Sur State University (SDSSU), Tandag City Surigao Del Sur, Philippines. Prof. (Dr.) Syed Umar , Dept. of Electronics and Computer Engineering, KL University, Guntur, A.P., India. Prof. (Dr.) Firas Rashad Al-Samarai, College of Veterinary Medicine, Univ. of Baghdad, Iraq. Prof. (Dr.) S. Veeramani, English Department, St.Josephâ€™s College,(Autonomous), Tiruchirappalli â€“ 620 002, Tamilnadu, South India. Prof. (Dr.) Nirmala Mungamuru Dept. of Computing, School of Engineering, Adama Science and Technology University, Adama, Ethiopia. Prof. (Dr.) P. Keerthika, CSE Department, Kongu Engineering College, Perundurai, Erode-638052, Tamilnadu, India. Prof. (Dr.) Himani, Professor and Dean ECE, at Marrilaxman Reddy Institute of Technology, Quthbullapur Mandal, Dundigal, Hyderabad, India. Prof. (Dr.) Deepak K. Sinha, Department of Computing, Jimma Institute of Technology, Jimma, Ethiopia. Prof. (Dr.) Eman Gohar, Cardio-Renal Physiology and Medicine, Department of Medicine|Division of Nephrology, UAB | The University of Alabama at Birmingham, KAUL 844 | 720 20th St S | Birmingham, AL 35233. Prof. (Dr.) Jaware Tushar H., E&TC Dept. at R.C. Patel Institute of Technology, Shirpur. Prof. (Dr.) MAHALAKSHMI .V, Department of Computer Science & Engineering, Bharathidasan University, Tiruchirappalli -23,India. Prof. (Dr.) Pinak Ranade, Principal Technical Officer, Spatial Sciences & Disaster Management Group (SS & DM Group), Center for Development of Advance Computing (C-DAC), Pune. Prof. (Dr.) Sanjiv M. Sansgiri, Professor and Head, Mechanical Engineering at Vishwakarma Institute of Information Technology, Pune 411 048, INDIA. Prof. (Dr.) S. Subramanian, Professor in Mathematics, PRIST University, Thanjavur. Prof. (Dr.) Maria Luisa A. Valdez, Dean of Colleges and Head of Graduate School, Batangas State University ARASOF Nasugbu Campus, Nasugbu 4231 Batangas, Philippines. Prof. (Dr.) Abdelhalim Zekry, Ain Shams University, Cairo. Prof. (Dr.) Amresh Chandra Pandey, Subject Matter Specialist (Agril. Engg. ), Krishi Vigyan Kendra, Latehar, Jharkhand, India. Prof. (Dr.) O P Monga, Professor of Sociology and Associate Dean, Faculty of Management Sciences and Liberal Arts, Shoolini University of Biotechnology and Management Sciences, Bajhol, Solan, Himachal Pradesh, India. Prof. (Dr.) S. Rajkumar, Associate Professor, Department of Mechanical Engineering, Dhanalakshmi Srinivasan Engineering College, Perambalur , Tamilnadu - State, India. Prof. (Dr.) Tanggis Bohnuud, Research Associate, Structural Bioinformatics Lab, Boston University. Prof. (Dr.) Prateek Srivastava, (Assistant Professor), Department of Computer Science and Engineering, School Of Engineering, Sir Padampat Singhania University, Udaipur, Rajasthan, India. Prof. (Dr.) Vikas Goyal , Head of the Department of Electronics and Communication in SECG, Gharuan. Prof. (Dr.) S.Subramanian, Professor in Mathematics, PRIST University, Thanjavur. Prof. (Dr.) Vishal S.Rana, Associate Prof & Head, Department of Business Administration, S.S.B.T';S College of Engineering & Technology, Bambhori,Jalgaon.(M.S). Prof. (Dr.) Solomon A. O. Iyekekpolor, Mathematics and Statistics, Federal University, Wukari- Nigeria. Prof. (Dr.) S. Saiganesh, Faculty of Marketing, Dayananda Sagar Business School, Bangalore, India. Prof. (Dr.) G. SAVITHRI, Department of Sericulture, S.P. Mahila Visvavidyalayam, Tirupati-517502, Andhra Pradesh, India. Prof. (Dr.) Abdullah M. Abdul-Jabbar, Department of Mathematics, College of Science, University of Salahaddin-Erbil, Kurdistan Region, Iraq. Prof. (Dr.) ( Mrs.) P.Sujathamma, Department of Sericulture, S.P.Mahila Visvavidyalayam, Tirupati-517502, India. Prof. (Dr.) Piyush Singhal, Mechanical Engineering Deptt., GLA University, India. Prof. Nawaraj Chaulagain, Department of Religion, Illinois Wesleyan University, Bloomington, IL. Prof. (Dr.) Mohsen Shafiei Nikabadi, Faculty of Economics and Management, Industrial Management Department, Semnan University, Semnan, Iran. Prof. (Dr.) Kumar Irayya Maddani, and Head of the Department of Physics in SDM College of Engineering and Technology, Dhavalagiri, Dharwad, State: Karnataka (INDIA). Prof. (Dr.) Shafi Phaniband, SDM College of Engineering and Technology, Dharwad, INDIA. Prof. (Dr.) Ravikumar C Baratakke, faculty of Biology,Govt. College, Saundatti - 591 126, India. Prof. (Dr.) NALIN BHARTI, School of Humanities and Social Science, Indian Institute of Technology Patna, India. Prof. (Dr.) Naveen.P.Badiger , Dept.Of Chemistry, S.D.M.College of Engg. & Technology, Dharwad-580002, Karnataka State, India. Prof. (Dr.) Bimla Dhanda, Professor & Head, Department of Human Development and Family Studies, College of Home Science, CCS, Haryana Agricultural University, Hisar- 125001 (Haryana) India. Prof. (Dr.) L. Suresh Kumar, Mechanical Department, Chaitanya Bharathi Institute of Technology, Hyderabad, India. Prof. (Dr.) Vinay Nassa, Prof. E.C.E Deptt., Dronacharya.Engg. College, Gurgaon India. Prof. Sunny Narayan, university of Roma Tre, Italy. Prof. (Dr.) Sanjoy Deb, Dept. of ECE, BIT Sathy, Sathyamangalam, Tamilnadu-638401, India. Prof. (Dr.) Y.P.Singh, (Director), Somany (PG) Institute of Technology and Management, Garhi Bolni Road, Delhi-Jaipur Highway No. 8, Beside 3 km from City Rewari, Rewari-123401, India. Prof. (Dr.) MIR IQBAL FAHEEM, VICE PRINCIPAL &HEAD- Department of Civil Engineering & Professor of Civil Engineering, Deccan College of Engineering & Technology, Dar-us-Salam, Aghapura, Hyderabad (AP) 500 036. Prof. (Dr.) Jitendra Gupta, Regional Head, Co-ordinator(U.P. State Representative)& Asstt. Prof., (Pharmaceutics), Institute of Pharmaceutical Research, GLA University, Mathura. Prof. (Dr.) N. Sakthivel, Scientist - C,Research Extension Center,Central Silk Board, Government of India, Inam Karisal Kulam (Post), Srivilliputtur - 626 125,Tamil Nadu, India. Prof. (Dr.) Omprakash Srivastav, Centre of Advanced Study, Department of History, Aligarh Muslim University, Aligarh-202 001, INDIA. Prof. (Dr.) K.V.L.N.Acharyulu, Associate Professor, Department of Mathematics, Bapatla Engineering college, Bapatla-522101, INDIA. Prof. (Dr.) Fateh Mebarek-Oudina, Assoc. Prof., Sciences Faculty,20 aout 1955-Skikda University, B.P 26 Route El-Hadaiek, 21000,Skikda, Algeria. Prof. (Dr.) P.P.Satya Paul Kumar, Associate Professor, Physical Education & Sports Sciences, University College of Physical Education & Sports, Sciences, Acharya Nagarjuna University, Guntur. Prof. (Dr.) Omprakash Srivastav, Department of Museology, Aligarh Muslim University, Aligarh-202 001, INDIA. Prof. (Dr.) L.Ganesamoorthy, Assistant Professor in Commerce, Annamalai University, Annamalai nagar â€“ 608002,Chidambaram, Tamilnadu, India. Prof. (Dr.) Umesh Sharma, Professor & HOD Applied Sciences & Humanities, Eshan college of Engineering, Mathura, India. Prof. (Dr.) K. John Singh, School of Information Technology and Engineering, VIT University , Vellore, Tamil Nadu , India. Prof. (Dr.)Sita Ram Pal (Asst.Prof. ), Dept. of Special Education, Dr.BAOU, Ahmedabad, India. Prof. (Dr.) Chandrakant Badgaiyan, Department of Mechatronics and Engineering, Chhattisgarh. Dr. (Mrs.) Shubhrata Gupta, Prof. (Electrical), NIT Raipur, India. Prof. (Dr.) Usha Rani. Nelakuditi, Assoc. Prof., ECE Deptt., Vignanâ€™s Engineering College, Vignan University, India. Prof. (Dr.) S. Swathi, Asst. Professor, Department of Information Technology, Vardhaman college of Engineering(Autonomous) , Shamshabad, R.R District, India. Prof. (Dr.) Raja Chakraverty, M Pharm (Pharmacology), BCPSR, Durgapur, West Bengal. Prof. (Dr.) K.V.N.R.Sai Krishna, H O D in Computer Science, S.V.R.M.College,(Autonomous), Nagaram, Guntur(DT), Andhra Pradesh, India. Prof. (Dr.) Kantipudi MVV Prasad, EC Department, RK University, Rajkot. Prof. (Dr.) Jitendra Gupta,Faculty of Pharmaceutics, Institute of Pharmaceutical Research, GLA University, Mathura. Prof. (Dr.) Rajiv Sharma, Department of Ocean Engineering, Indian Institute of Technology Madras, Chennai (TN) - 600 036,India. Prof. (Dr.) Aparna Sarkar,PH.D. Physiology, AIPT,Amity University , F 1 Block, LGF, Sector-125,Noida-201303, UP ,India. Prof. (Dr.) Manpreet Singh, Professor and Head, Department of Computer Engineering, Maharishi Markandeshwar University, Mullana, Haryana, India. Prof. (Dr.) Sukumar Senthilkumar, Senior Researcher, Advanced Education Center of Jeonbuk for Electronics and Information Technology, Chon Buk National University, Chon Buk, 561-756, SOUTH KOREA. .
Prof. (Dr.) Hari Singh Dhillon, Assistant Professor, Department of Electronics and Communication Engineering, DAV Institute of Engineering and Technology, Jalandhar (Punjab), INDIA. .
Prof. (Dr.) Poonkuzhali, G., Department of Computer Science and Engineering, Rajalakshmi Engineering College, Chennai, INDIA. .
Prof. (Dr.) Bharath K N, Assistant Professor, Dept. of Mechanical Engineering, GM Institute of Technology, PB Road, Davangere 577006, Karnataka, INDIA. .
Prof. (Dr.) Ratneshwer, Department of Computer Science (MMV),Banaras Hindu University Varanasi-221005, India. Prof. (Dr.) Siddharth Sharma, University School of Management, Kurukshetra University, Kurukshetra, India. Prof. (Dr.) Ajay Solkhe, Department of Management, Kurukshetra University, Kurukshetra, India. Prof. (Dr.) Hardeep Anand, Department of Chemistry, Kurukshetra University Kurukshetra, Haryana, India. Satya Rishi Takyar , Senior ISO Consultant, New Delhi, India. Prof. (Dr.) Harish Kumar, Department of Sports Science, Punjabi University, Patiala, Punjab, India. Prof. (Dr.) Manish Gupta, Department of Mechanical Engineering, GJU, Haryana, India. Prof. Mridul Chawla, Department of Elect. and Comm. Engineering, Deenbandhu Chhotu Ram University of Science & Technology, Murthal, Haryana, India. Prof. Seema Chawla, Department of Bio-medical Engineering, Deenbandhu Chhotu Ram University of Science & Technology, Murthal, Haryana, India. Prof. (Dr.) Atul M. Gosai, Department of Computer Science, Saurashtra University, Rajkot, Gujarat, India. Prof. (Dr.) Ajit Kr. Bansal, Department of Management, Shoolini University, H.P., India. Prof. (Dr.) Sunil Vasistha, Mody Institute of Tecnology and Science, Sikar, Rajasthan, India. Prof. Vivekta Singh, GNIT Girls Institute of Technology, Greater Noida, India. Prof. Ajay Loura, Assistant Professor at Thapar University, Patiala, India. Prof. Sushil Sharma, Department of Computer Science and Applications, Govt. P. G. College, Ambala Cantt., Haryana, India. Prof. (Dr.) Sandeep Gupta, Department of Computer Science & Engineering, Noida Institute of Engineering and Technology, Gr.Noida, India. Prof. (Dr.) Suvroma Gupta, Department of Biotechnology in Haldia Institute of Technology, Haldia, West Bengal. Prof. Bhubneshwar Sharma, Department of Electronics and Communication Engineering, Eternal University (H.P) India. Prof. Love Kumar, Electronics and Communication Engineering, DAV Institute of Engineering and Technology, Jalandhar (Punjab). Prof. S.KANNAN, Department of History, Annamalai University, Annamalainagar- 608002, Tamil Nadu (India). Prof. (Dr.) Hasrinah Hasbullah, Faculty of Petroleum & Renewable Energy Engineering, Universiti Teknologi Malaysia, 81310 UTM Johor Bahru, Johor, Malaysia. Prof. Rajesh Duvvuru, Dept. of Computer Sc. & Engg., N.I.T. Jamshedpur, Jharkhand, India. Prof. (Dr.) Bhargavi H. Goswami, Department of MCA, Sunshine Group of Institutes, Nr. Rangoli Park, Kalawad Road, Rajkot, Gujarat, India. Prof. (Dr.) Essam H. Houssein, Computer Science Department, Faculty of Computers & Informatics, Benha University, Benha 13518, Qalyubia Governorate, Egypt. Arash Shaghaghi, University College London, University of London, Great Britain. Prof. (Dr.) Anand Kumar, Head, Department of MCA, M.S. Engineering College, Navarathna Agrahara, Sadahalli Post, Bangalore, PIN 562110, Karnataka, INDIA. Prof. (Dr.) Venkata Raghavendra Miriampally, Electrical and Computer Engineering Dept, Adama Science & Technology University, Adama, Ethiopia. Prof. (Dr.) Jatinderkumar R. Saini, Director (I.T. ), GTU's Ankleshwar-Bharuch Innovation Sankul &Director I/C & Associate Professor, Narmada College of Computer Application, Zadeshwar, Bharuch, Gujarat, India â€“ 392 011. Prof. Jaswinder Singh, Mechanical Engineering Department, University Institute Of Engineering & Technology, Panjab University SSG Regional Centre, Hoshiarpur, Punjab, India- 146001. Prof. (Dr.) S.Kadhiravan, Head i/c, Department of Psychology, Periyar University, Salem- 636 011,Tamil Nadu. Prof. (Dr.) VENKATESWARLU B., Director of MCA in Sreenivasa Institute of Technology and Management Studies(SITAMS), Chittoor. 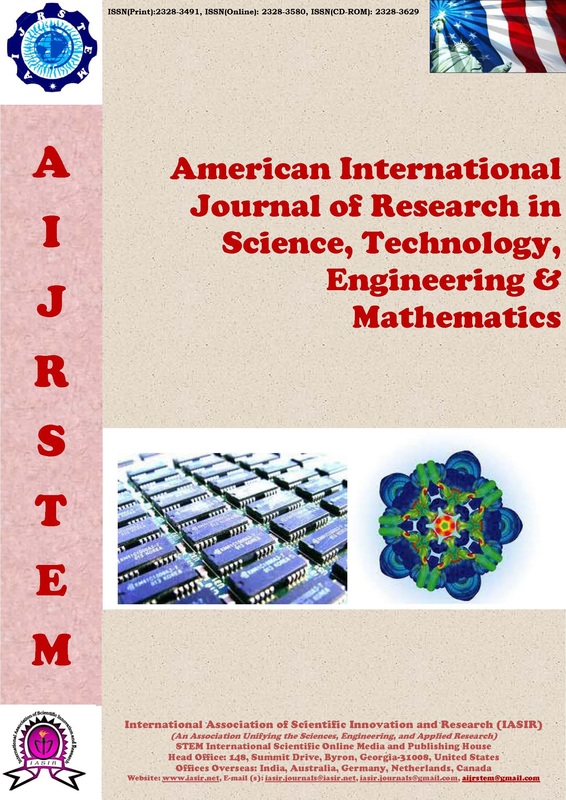 Prof. (Dr.) Chitranjan Agrawal, Department of Mechanical Engineering, College of Technology & Engineering, Maharana Pratap University of Agriculture & Technology, Udaipur- 313001, Rajasthan, India. Prof. (Dr.) Rangnath Aher, Principal, New Arts, Commerce and Science College, Parner, Dist- Ahmednagar, M.S. India. Prof. (Dr.) Latika Kharb, IP Faculty (MCA Deptt), Jagan Institute of Management Studies (JIMS), Sector-5, Rohini, Delhi, India. Raj Mohan Raja Muthiah, Harvard Medical School, Massachusetts General Hospital, Boston, Massachusetts. Prof. (Dr.) Chhanda Chatterjee, Dept of Philosophy, Balurghat College, West Bengal, India. Prof. (Dr.) Muthukumar .Subramanyam, Registrar (I/C), Faculty, Computer Science and Engineering, National Institute of Technology, Puducherry, India. Prof. Sube Singh, Assistant Professor, Department of Computer Engineering, Govt. Polytechnic, Narnaul, Haryana, India. Prof. Himanshu Arora, Delhi Institute of Technology and Management, New Delhi, India. Dr. Sabina Amporful, Bibb Family Practice Association, Macon, Georgia, USA. Dr. Pawan K. Monga, Jindal Institute of Medical Sciences, Hisar, Haryana, India. Dr. Sam Ampoful, Bibb Family Practice Association, Macon, Georgia, USA. Dr. Nagender Sangra, Director of Sangra Technologies, Chandigarh, India. Vipin Gujral, CPA, New Jersey, USA. Sarfo Baffour, University of Ghana, Ghana. Monique Vincon, Hype Softwaretechnik GmbH, Bonn, Germany. Marta Trochimowicz, Rhein-Zeitung, Koblenz, Germany. Vijay Attri, Software Developer Google, San Jose, California, USA. Neeraj Khillan, Wipro Technologies, Boston, USA. Ruchir Sachdeva, Software Engineer at Infosys, Pune, Maharashtra, India. Anadi Charan, Senior Software Consultant at Capgemini, Mumbai, Maharashtra. Pawan Monga, Senior Product Manager, LG Electronics India Pvt. Ltd., New Delhi, India. Sunil Kumar, Senior Information Developer, Honeywell Technology Solutions, Inc., Bangalore, India. Bharat Gambhir, Technical Architect, Tata Consultancy Services (TCS), Noida, India. Vinay Chopra, Team Leader, Access Infotech Pvt Ltd. Chandigarh, India. Sumit Sharma, Team Lead, American Express, New Delhi, India. Vivek Gautam, Senior Software Engineer, Wipro, Noida, India. Anirudh Trehan, Nagarro Software Gurgaon, Haryana, India. Manjot Singh, Senior Software Engineer, HCL Technologies Delhi, India. Rajat Adlakha, Senior Software Engineer, Tech Mahindra Ltd, Mumbai, Maharashtra, India. Mohit Bhayana, Senior Software Engineer, Nagarro Software Pvt. Gurgaon, Haryana, India. Dheeraj Sardana, Tech. Head, Nagarro Software, Gurgaon, Haryana, India. Naresh Setia, Senior Software Engineer, Infogain, Noida, India. Raj Agarwal Megh, Idhasoft Limited, Pune, Maharashtra, India. Shrikant Bhardwaj, Senior Software Engineer, Mphasis an HP Company, Pune, Maharashtra, India. Vikas Chawla, Technical Lead, Xavient Software Solutions, Noida, India. Kapoor Singh, Sr. Executive at IBM, Gurgaon, Haryana, India. Ashwani Rohilla, Senior SAP Consultant at TCS, Mumbai, India. Anuj Chhabra, Sr. Software Engineer, McKinsey & Company, Faridabad, Haryana, India. Jaspreet Singh, Business Analyst at HCL Technologies, Gurgaon, Haryana, India.